In this comprehensive guide, I am going to tell you everything you need to know about getting a new postal ID in the Philippines. I will show you the exact steps on how to avail of the ID as well as the requirements you must fulfill to ensure that you get the card as quickly as possible. The good thing about postal IDs is that you can get them in any post office in the country. It's one of the easiest and fastest to obtain identification cards in the Philippines. Since it's issued by the government, it's widely accepted as a means of identification in both public and private transactions. Most banks and other financial institutions in the country honor the ID as proof of identity for sensitive banking transactions. 1. Get at least two copies of the application form. You can get them at the nearest postal office or you can download them from the PhilPost website. 2. Completely fill up the forms. 3. Gather all the requirements. 4. Submit the required documents for screening. 5. Go to the nearest PhilPost ID capture station to have your photo and fingerprints taken. 6. That's it. If you complete all of the above, all you need to do now is wait for the new ID card to be delivered to you. Delivery can take between 15 to 30 days. 7. If the card isn't delivered to you, visit the postal office where you applied to check the status of your card. How much does a new postal ID cost? 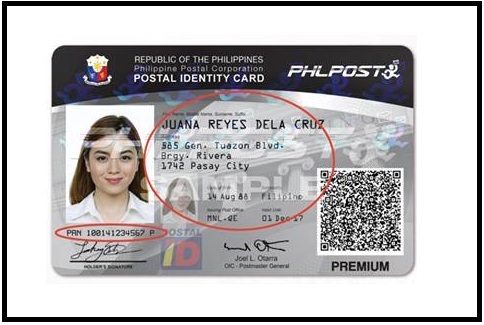 According to the official website of the Philippine Postal Corporation (PhilPost), the price of a new Philippine postal ID is five hundred and four (504) pesos. The breakdown of the cost is as follows: 450 for the card including the delivery fee and 54 for the 12% value-added tax (VAT). According to PhilPost, this amount remains the same for all postal offices in the country. However, this doesn't seem to be true because some people are reporting that they paid more while others say that they paid less. In short, the fee for the card may either be higher or lower in your location. How long will the ID be valid? It will be valid for three (3) years starting from the day you received the card. This validity period applies to all Filipinos and for foreign residents who have a Special Retiree's Resident Visa or SRRV. For foreign residents who don't have an SRRV, the validity period is only one (1) year. You can see if your card is still valid or not by looking at the expiry date which is clearly imprinted on the card. 1. Two (2) copies of duly-accomplished application forms. 1. Married women should bring with them a marriage certificate in the event that they need to validate the change in their surname from the one one shown in their birth document. 2. With regards to replacement of a lost or stolen ID, most of the steps and requirements are the same. it's still advisable that you visit where you registered and ask what steps you must take.